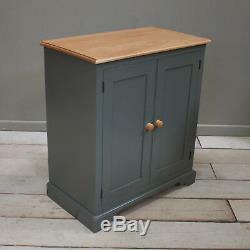 School Cupboard, Storage Cabinet 2 door in Vintage Grey. A replica school cupboard finely painted in our Dark Grey (very similar to Farrow and Ball Downpipe), comprising two shaker-like panelled doors and 2 removable shelves to accommodate all those bits and bobs that need a home, whether in the kitchen or nursery. If you'd like a different colour or finish please call, we can do most things. 36"(91cm)H x 36"(91cm)W x 16(40cm)D. &###xA0; &###xA0; &###xA0; &###xA0; &###xA0; &##xA0. &###xA0; &###xA0; &###xA0; &###xA0; &###xA0; &###xA0;&##xA0. And yes, we still take cheques! When possible we deliver using our own transport but on occasion use a specialised courier company who we trust to deliver with the care we expect. Any product you return must be in the same condition you received it and in the original packaging. Made using FSC pine No assembly required. The item "School Cupboard, Storage Cabinet 2 door in Vintage Grey" is in sale since Monday, January 22, 2018. This item is in the category "Home, Furniture & DIY\Furniture\Cabinets & Cupboards". The seller is "thegoodshelfcompany" and is located in Henley-on-Thames. This item can be shipped to United Kingdom.